(DEXTER, Mich)—Jolly Pumpkin’s quintessential beer – La Roja – may be hard to find, but two new specialty brews will hit the marketplace in limited quantities this month and are sure to quench the thirst of sour beer lovers around America. Rojzilla and La Roja du Kriek will be distributed in Michigan and 34 other states during the brand’s “April Showers Bring Jolly Pumpkin Sours” campaign. La Roja (7.2% ABV | 25 IBU) was the second beer to be released by Jolly Pumpkin, after opening in 2004. This artisan red ale, brewed in the Flanders tradition, is deep amber in color with earthy caramel, spice and sour fruit notes that are developed through natural barrel aging. Flanders ales are fermented with usual brewer’s yeast in an unfiltered and unpasteurized fashion, then placed into oak barrels to age and mature. The mature beer is then blended with younger beer, to adjust the taste for consistency. The name comes from the usual color of these ales, which are descendent from English porters of the 17th century. Due to the extensive time involved in the production of La Roja, it is only released in limited quantities and is considered one of the most sought-after sour ales in the country. La Roja du Kriek – Sour Amber Ale with Michigan Cherry Juice. This is what happens when 3100 gallons of 2013 La Roja meets 50 gallons of Michigan tart cherry juice, aged in oak barrels and bottle conditioned – a perfect blend of sour and tart joie de vivre! (7.5% ABV | 750ml). Jolly Pumpkin celebrates its 11th year in 2015, and is regarded as the nation’s first and premier all-sour brewery. Under the watchful guidance of master brewer, Ron Jeffries. Jeffries began studying and experimenting with brewing in the early 1990s, always with an eye towards opening his own brewery. With a special interest in rustic country ales, he launched his professional brewing career in 1995, and quickly became known as an innovative and respected member of Michigan’s emerging craft beer scene. Jeffries realized his dream in the summer of 2004 when he and his wife, Laurie, launched Jolly Pumpkin Artisan Ales in Dexter, Mich., the first brewery focused on and offering an exclusive selection of oak-aged, wild and sour beers in the United States. Together Ron and Laurie Jeffries, with the help of their son Daemon, have grown Jolly Pumpkin into a boutique brand with widespread distribution and global recognition. Over the years, Jeffries’ vocation has evolved from brewer, craftsman and artist to most recently, philosopher and visionary of all things beer. His outstanding dedication to the art of brewing has led to international attention and accolades. An advocate for the simpler life, Jeffries believes in decelerating the hectic tempo of modern life and returning to a slower, more livable pace. He runs the brewery on what he calls “Hawaiian time,” allowing Jolly Pumpkin to maintain traditional small scale production while protecting both the outstanding complexity and simplicity of the beverage. 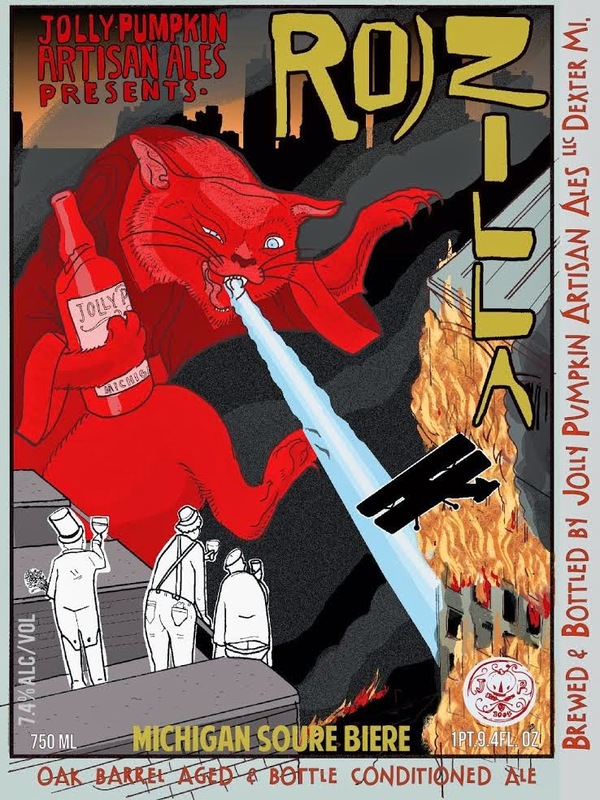 A draft and bottle release for Rojzilla and La Roja du Kriek will take place the weekend of June 6-7 at the Null taproom in Dexter, as well as Jolly Pumpkin locations in Ann Arbor, Midtown in Detroit and Traverse City. Throughout the coming month, special tastings and release parties will be held around the country featuring these two beers as well. All events will be promoted on the Jolly Pumpkin Facebook. Jolly Pumpkin is part of Northern United Brewing Co., which also encompasses the Grizzly Peak and North Peak Beer Co. craft beer brands, as well as Nomad Ciders, Civilized Spirits and Bonafide Wines. NUBC’s philosophy focuses on a dedication to conservation, inspiration and locally-sustainable practices. 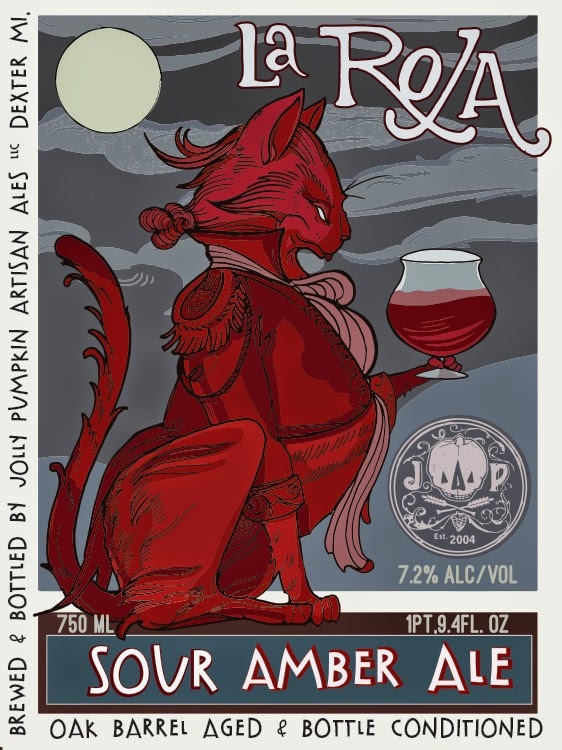 Posted in Blog.Tagged Jolly Pumpkin Artisan Ales, Sour beer.